"We took a secret vote. We're not leaving. We're never leaving." This might seem an odd choice for Cornetto Week, but not only was The Big Chill explicitly called out as an influence by both Wright and Pegg, it also played as the matinee feature before the Brattle's Cornetto triple feature. The first act of World's End largely centers around Pegg's Gary King rounding up his childhood friends and convincing them all to return with him to their home town. Most of them haven't seen each other in years and the way their relationships echo or differ from those of their younger selves is not only what drives much of the action, it's also some of the strongest stuff in the film. It's easy to draw a parallel to the similar group dynamic in The Big Chill, however the entire time I was watching the film, my thoughts were pulled in a slightly different direction. I have two groups of very close friends: there's the guys I went to high school with and there's Noteworthy, my college a cappella group. Fortunately we all stay in touch pretty regularly - the high school guys usually get together around the holidays when people are home visiting family and the college folks actually stage a Noteworthy reunion in a different location every year. Now that we're all entering our 30's, we're also finding new reasons for everyone to get together. Two weeks ago I traveled to New York for the wedding of my high school buddy Rob, while the Noteworthy crew has now seen four members get married and one baby born, with another arriving in about two months time. These are always joyous occasions and whenever I spend quality time with either group, I always find myself overwhelmed with a sense of comfort and bliss to have everyone in the same room once again. But the time is approaching when that simple pleasure will no longer be possible, and we'll find ourselves gathering to bid a final goodbye to one of our own. Lawrence Kasdan's The Big Chill depicts just such on occurrence, as a group of seven now-grown college friends attend the funeral for the eighth member of their clan after he commits suicide. The group ends up spending the weekend in a large summer house, taking stock of their lives while falling into the old patterns and rhythms that forged their bond of friendship all those years ago. Old wounds are reopened, unrealized affections resurface and that which had gone unspoken is finally given a voice. It's not a film where a lot "happens" but nonetheless it's lovely just watching the chemistry between characters as disparate as Kevin Kline and Glenn Close's married couple, Tom Berenger's mustachioed TV star (likely modeled after a Magnum P.I.-era Tom Selleck), Mary Kay Place's lawyer with a ticking biological clock and William Hurt's impotent, drug-fueled misanthrope. The weekend becomes a delicate tonal balancing act; one moment everyone's dancing around the kitchen while cooking dinner and the next they're all stoned on the couch, searching for meaning and reason in their friend's shocking suicide. Fortunately it's a stellar cast, each of whom are able to handle these dramatic shifts and make them feel totally natural. 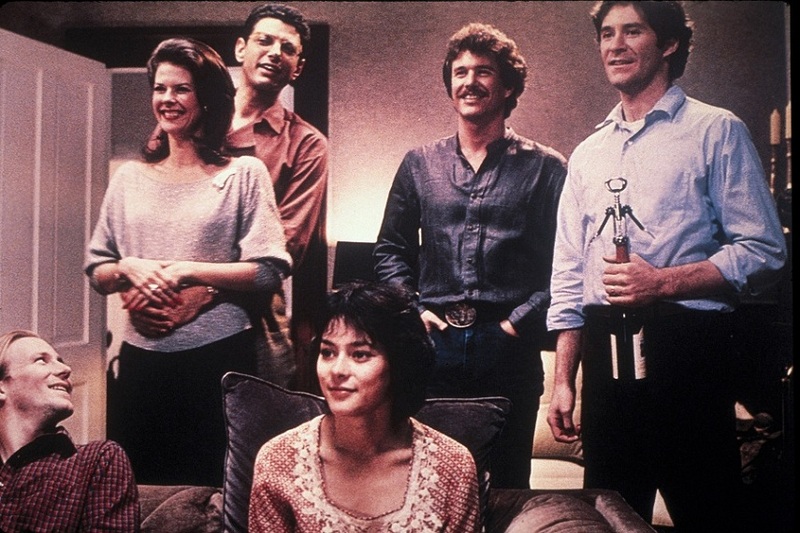 There are some things that don't entirely work on screen, among them Kevin Kline's southern accent, the weird resolution of Mary Kay Place's baby dilemma and Meg Tilly's entire character. But for the most part these feel like minor speed bumps in what amounts to a strong character piece with an almost impossibly great soundtrack. But it's hard for me to watch this movie without feeling a sense of dread, that it's only a matter of time until I'll be in an identical situation. I recently found out that a girl who was in the class behind me in high school, a girl I was friends with but hadn't seen in years, had passed away from melanoma. Shockingly enough, she's actually the third member of that class to die since graduating a little over 11 years ago. That's a fact I can barely wrap my head around, but it's also something I should probably start getting used to. Granted I'm sure there will be many more birthdays, weddings and babies than there will be funerals in the next decade or so, but slowly, imperceptibly the tide will turn. A car accident, a cancer scare, a sudden heart attack...these are the things that come without warning and, quite frankly, scare the hell out of me. What will it be like when these people who I've always considered to be family are suddenly no longer around? How will that change the dynamics between those of us who remain? As I mentioned, my two circles of friends still get together fairly often, but will that make it harder to easier to cope when one or more of us is gone? It's hard to say, but it's also hard for me to imagine any of these people not being in my life anymore. I've already experienced a small dose of this imminent future. Almost four years ago, Noteworthy experienced its first loss in the form of Matt Starring, a talented young singer/songwriter who also served as the group's musical director. Tragically, Starring died from leukemia at the age of 23. Every November the members of Noteworthy now celebrate Mattsgiving, where we don red Chucks and gather together in Boston, Los Angeles and New York to remember our friend who we lost far, far too soon. I couldn't be there for his funeral, something I've always felt bad about, so I've yet to live through the particular scenario that Kasdan brings to life, with the sense of fresh pain and immediate emptiness surrounded and sometimes hidden by laughter, music and a lot of drugs and alcohol. But it's coming. I can already start to see it taking shape over the horizon, like a foreboding harbinger of melancholy and overcompensation. In the meantime, all I can do is look at the friends around me and savor every second of their company and camaraderie for as long as the universe will allow it.